Rimrock is proud to announce that two of our staff were recently recognized for their work in our community. Rimrock is fortunate to have such an amazing, talented team of people dedicated to helping those struggling with addiction. From our peer support specialists and counselors, to our resident techs and supervisors, each member of our staff brings unique skills and strengths to our organization. Recently, two of the people leading this talented group were recognized in our community for their leadership and dedication. 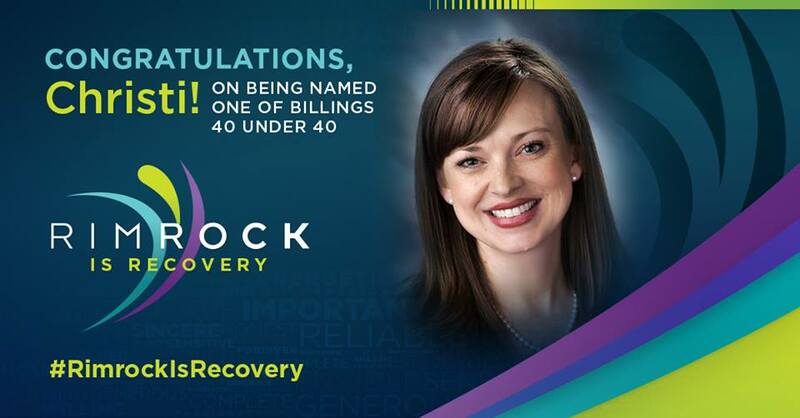 Christi Beals, Chief Nursing Officer and Senior Director of Inpatient Services, was named one of The Billings Gazette’s “40 Under 40” in February 2019. Each year, The Billings Gazette profiles some of the area’s most outstanding business professionals that have demonstrated an ability to make a difference in their community. 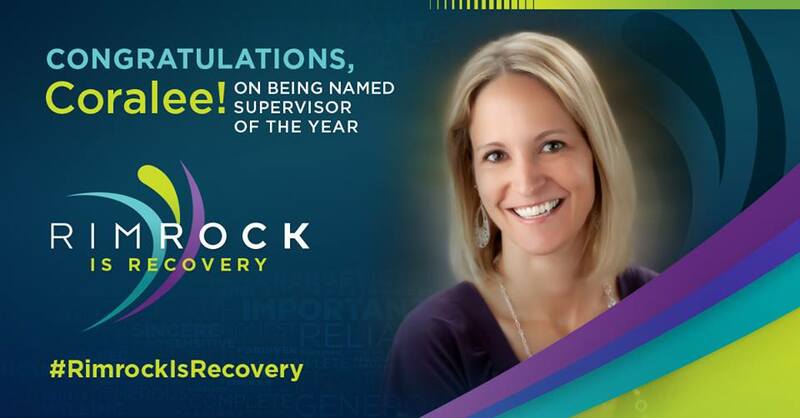 In 2016, Christi joined the team at Rimrock Foundation where she feels fortunate to work with an amazing team that helps people who struggle with addiction. Christi has dedicated more than 15 years to the healthcare profession. She graduated with a Bachelor’s of Science in Nursing and a Bachelor’s of Science in Business Management from Montana State University, and later earned her Master’s of Business Administration from the University of Mary. Christi has extensive experience leading a broad range of nursing departments in the acute care setting including a Senior Leadership position for one of the largest acute care hospitals in Montana. Along with her nursing leadership positions, Christi has also been an Executive team member of a psychiatric residential treatment facility where she led the departments responsible for business development, marketing, public relations, and human resources. Christi is currently a member of the Montana State University Billings Healthcare Advisory Board and has also served on the board of directors at COR Enterprises for the past four years. A Montana native, Christi loves enjoying the beautiful outdoors with her family. Coralee Schmitz, Chief Operations Officer at Rimrock, has been named Supervisor of the Year by the Billings Chamber as part of their 2019 Business Excellence Awards. Every year, the Billings Chamber of Commerce honors outstanding individuals in the Billings area that have made an impact on our business community. The public nominates outstanding businesses and professionals in a variety of categories, and the winners are selected by an anonymous voting process. Supervisor/Manager of the Year is awarded to an individual who has demonstrated leadership skills in motivating employees to achieve their highest potential while helping to achieve the overall mission and objectives of the organization. As COO, Coralee applies her leadership and expertise to all areas of our service, including Adult Treatment, Adolescent Treatment, Sober Housing, and the Treatment Court programs. Coralee holds a Master’s Degree in Psychology, a Master’s in Business Administration, and is licensed by the state of Montana as an Addiction Counselor. She also holds accreditation from the National Association of Alcohol and Drug Addiction Counselors as a Masters Level Addiction Counselor and holds certification from CSAT (Center for Substance Abuse Treatment) for Motivational Enhancement Therapy for Adolescent Cannabis abusers. Coralee is also certified as by the Commission for Accreditation of Rehabilitation Facilities (CARF) as a surveyor. Way to represent Rimrock, ladies! You are both an important part of the work we do every day and we are grateful for the talents and leadership you provide to our staff and our clients. PREV Medication Assisted Treatment (MAT)	NEXT Join Rimrock for National Prescription Drug Take Back Day 2019!